Is a bulletproof whiteboard better than nothing? Maybe yes, maybe no. Keep in mind that there’s a reason our soldiers carry guns into combat, not whiteboards. 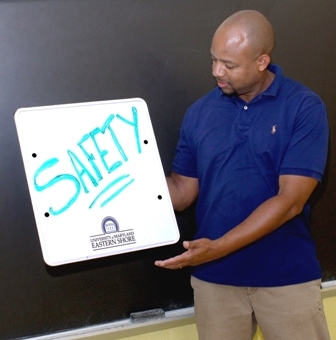 UMES faculty members will be issued the 18-inch by 20-inch Bulletproof Whiteboards for use in their classrooms. Like first-generation whiteboards, they can serve as portable writing tablets during delivery of lectures and labs. University officials see the technology as another proactive step among many the university has taken to provide a safe learning environment. “We appreciate and applaud Hardwire for its innovative adaptation of this technology to potentially save lives. Their entrepreneurial spirit serves as a great example for our students,” UMES President, Juliette B. Bell, said. Not only is a bulletproof whiteboard purely defensive, it defends only the person holding it and it isn’t even that big. So, would it deter any killer? No. Would it stop any killer? No. On the other hand, if let’s say the university had taken that same money and bought weapons and NRA training for any professor who wanted it, could that conceivably deter a killer? Absolutely. Could those guns be used to stop a killer if he tried something? Absolutely. Has there ever been any crime stopped with a bulletproof whiteboard? EXACTLY.